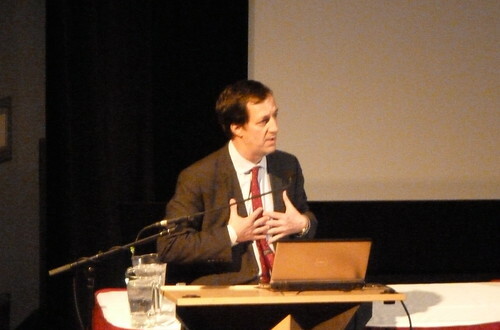 Andrew Coyne on February 25, 2014 at SFU Woodwards. National Post columnist Andrew Coyne spoke to a crowd at SFU Woodwards on Tuesday, February 25th, on the topic of road pricing to reduce congestion. His talk was the second in a series entitled Rethinking Transportation presented by TransLink and a number of others (as listed on the series’ website) trying to spur conversations on ideas, analysis and approaches to understanding transportation issues in Metro Vancouver. In seeking to achieve these goals, Coyne did not disappoint. He is hardly the first nor likely to be last to describe road pricing as the solution for transportation ills in Vancouver. In late 2013, the SFU Centre for Dialogue convened a number of regional dialogues as well as a community summit on the topic. The reports from the Moving in Metro events (which I was able to attend) were released earlier last week. Writing in the Georgia Straight last week, Daniel Wood made a case for road pricing, illustrating the benefits it has brought to the places that have adopted it, while also highlighting the numerous challenges (many political) that would need to be overcome in making it a reality in to Vancouver. For some of his talk, for those of us privileged to have been following this conversation as it has unfolded thus far, Coyne seemed to be treading familiar ground. Like most others talking about transit tend to do, the talk started with an illustration of the problem of congestion: the massive amounts of time wasted because of congestion; the tried and failed attempts to shifting people’s behaviours away from single-occupancy vehicles; the almost impossible persuasive task of helping people to understand themselves not only as victims of congestion but, as drivers, simultaneous contributors to it. He also made the point that the current set-up, rather than rationing the limited supply of a good through the mechanism of a price, was instead rationing it out through the time people were willing to spend either waiting in congestion or waiting in public transit, to seemingly no one’s ultimate satisfaction or benefit. On the price of driving, Coyne was similarly probably speaking to the converted. It has been argued, proven consistently and is generally widely accepted that the price of driving as it stands right now does not currently reflect the costs imposed on society by automobile activity — and that car-centric policies qualify as an effective subsidy on automobile-centric lifestyles (Coyne described sprawl as the cousin of congestion). He sees mobility pricing as an instrument to not only remove that subsidy but also to use price to more effectively communicate the actual cost of driving, and in so doing, give people the information and incentive to make better choices, such as using non-car alternatives; or, in the converse, to have a mechanism to pay for uncongested, more reliable roads in an informed fashion. Where Coyne veered from previous commentators in this respect was that he applied the same above thinking on prices and subsidies to transit, arguing that a public monopoly on transit was in effect subsidizing it in a way that was skewing or masking the market signals that would spur innovation. Concerns about equity of access to mobility through public transit, Coyne stated, should be addressed through supplements to income rather than reductions in price. He voiced a desire for transit operators “to be up late at night thinking about how to grow ridership” (implying that such a thing wasn’t happening a present because transit is subsidized and, presumably, leading to complacent public servants). For this reason, he is not in favour of directing road pricing revenues to building better transit systems, preferring schemes that would return these revenues back to the public through rebates or setting up a public trust that would pay dividends to citizens. Can mobility pricing give us the region we want, from the one we have now? The weakest part by far of Coyne’s proposal is that it has apparently little to say about the streets, cities and towns that already exist in their car-dominated state. He stated that, were such a scheme put a in place, he expected the housing market would create more density to reduce the requirement of car dependency. Another weakness, pointed out in a question by Eric Doherty, is that it was clearly aimed at solving congestion and had almost no bearing on the imperative of climate change. Coyne acknowledged this openly, stating that mobility pricing is an instrument for the specific problem of congestion, but that other problems can and should be addressed by other complementary instruments such as a carbon tax. Shauna Sylvester from the SFU Centre for Dialogue also raised the question of whether farebox revenues would be adequate to raise the capital funds required for rapid transit projects, to which Coyne responded that they ought to be able to argue the merits of consistent revenue to do the borrowing to get the projects going, much as other public projects in sectors like healthcare do. One valuable point Coyne expressed was that mobility pricing has never been rejected in a referendum of users after they have actually experienced it fully implemented. This is key for those of us in Metro Vancouver watching the almost daily back-and-forths between the TransLink Mayor’s Council and the BC Provincial Government. In a very short span of time, mobility pricing has moved off, then back onto, the table of things the Province is open to having be on the ballot for the regional referendum on funding public transit. The risk of rejecting a solution based on just reading about it, is one that Coyne is helpful to warn us about. Firstly, that road pricing as a solution has a lot going for it, but it still requires that a significant portion of the public to understand and agree with mobility as something that’s historically been free that can be improved if it is paid for. Secondly, that the specifics of Vancouver’s situation — ranging from some areas of clear, high levels of demand for transit service, and other areas highly dependent on automobiles for mobility marked by infrequent, unreliable or unpleasant transit service — will require a lot of nuancing. It may be similar to what other cities have faced, but it will certainly require dedication to being thoughtful to how congestion weighs against a whole host of other policy goals, such as livable neighbourhoods, compact development or affordability. In Coyne’s talk, I heard the application of economic ideals, but precious few tractable suggestions to work through the concerns about mobility pricing that Metro Vancouver residents have expressed for it to be considered successful. Website for Moving in Metro: a discussion on mobility pricing from the SFU Centre for Dialogue, including videos to presentations made during the Community Summit event on November 29, 2013. A Storify with initial reactions on Twitter from the #movingthefuture hashtag for the event.